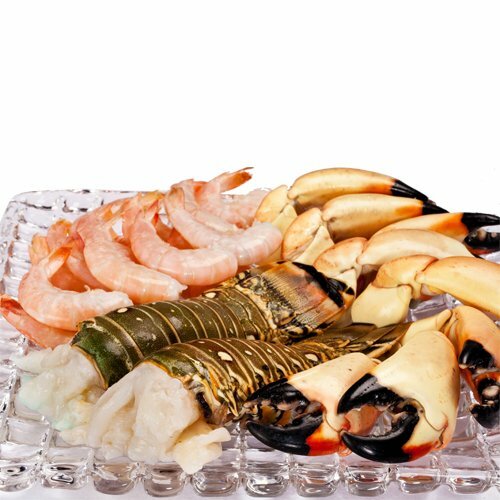 Fresh, Never Been Frozen: crab claws, Key West pink shrimp, spiny lobster tails with signature sauce and a mallet. A meal to be remembered! Tempt the palate with luscious shellfish, and cook to your heart's delight. 8 each Stone Crab Claws (or Snow Crab Claws when out of season), 18 each Key West Pink Shrimp (raw, shells on), 2 each Florida Spiny Lobster Tails (approx. 8 oz. each), 1 pack of Francesca's Signature Sauce & 2 Wooden Mallets. We will substitute similar or comparable items if the seafood is unavailable. Free overnight shipping within the 48 contiguous U.S. states. NOTE: We will substitute similar or comparable items if the seafood is unavailable (out of season). If you have any questions about this product by Francesca's Favorites, contact us by completing and submitting the form below. If you are looking for a specif part number, please include it with your message.